Sighs.. another time-fusion-thing-of-a-drama. (With another -Faith- coming up) Frankly speaking, i’m sick of it, but my curiosity is greater. I don’t think it’s the plot that is the problem, it’s probably the directing, editing and just… the drama doesn’t have appeal. I can already see the main storyline of the drama. Guy gets misunderstood because he was at the wrong place at the wrong time, they find out he’s a great doctor because all the people he meets just happen to have some kind of medical problem that requires him to perform surgery like immediately or they will die. Blah blah blah. This is why i don’t watch as many japanese dramas. Because most of the plot has this issue of repeating the same thing with differing details each and every episode. Sure, we get some side-line love story or some secondary actors’ story and maybe the situation’s difficulty increases, but it gets boring because we know what’s going to happen -he keeps every one alive and kicking except for maybe one (or two). I keep seeing him drill holes into peoples’ head every episode i’m getting a headache. 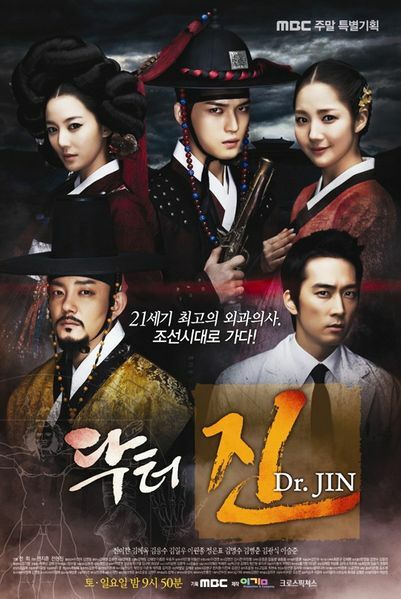 Another ‘flaw’ in this show that was addressed in the above two other dramas, no one around Dr. Jin seems to be questioning his way of speaking, because as all kdrama viewers know, the way of speaking in the Joseon era and now is quite different. That’s one of the problems with medical dramas. We know that in medical dramas, we’re going to see the main actors save (or try to) lives every episode, but it’s the little things that make them watchable. Lee Ha Eung and gisaeng Chun Hong are probably the more interesting ones. I liked Park MinYoung in City Hunter and SSKS but i’m not sure how i feel about her here yet. Jin Hyuk is great so far, i like how he can’t tolerate it when people disturbs him during his operation. I mean seriously people, you shouldn’t yell at people when they are hammering a hole into someone’s head. That is so dangerous. JaeJoong is decent, i’m no longer afraid of watching him act after i realise that he isn’t that awkward after all (from Protect the boss) and is good enough for me to not cringe. Though i think putting him in Joseon clothes and that awful hat is a waste of his good looks. Now he only looks decent. 😦 Another character i’m fond of would be Young Hwi, Park Min Young’s character’s older brother. We all have that soft spot for the good guy (who is a bad guy in the government’s eyes) but who acts like a helpless guy to cover up his true identity. So far, i’m not exactly loving the show, but there’s something about it that keeps me hanging around (for now). I hope it wouldn’t turn out like what i expected (same thing every episode) and maybe it will become better after a couple more episodes. This show isn’t for people who faint at the sight of blood or hear the hammering of skulls. I personally can’t take it when he cuts the skin. Eew!